Rivalry among key players of in the global solvents market is likely to boost the profit charts in the years to come. The major companies in the market include Sasol Solvents, Dow Chemical Company, Celanese Corporation, BASF SE, Ashland Inc., Maruzen Petrochemical, Eastman Chemical Company, Honeywell International Inc., Exxon Mobil Corporation, Ineos A.G., Solvay Chemicals, and Shell Chemical among others. 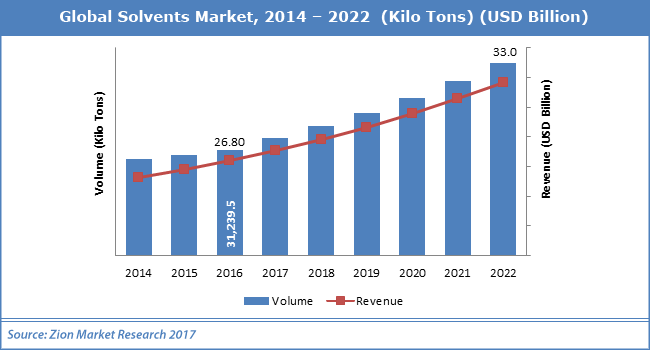 According to Zion Market Research’s analysts, the global solvents market was capitalized at USD 26.80 Billion in 2016 and is likely to cross USD 33.0 Billion in 2022, developing at a CAGR of 4.0% from 2017 to 2022. When it comes to volume, the global solvents stays at 31,239.5 Kilotons. “Developing automotive and construction sectors all over the world are the major reasons anticipated to tower the global solvents market,” as per the experts at Zion Market Research. Increasing requirement for solvents for different applications particularly in developing areas of India, China, and Brazil is expected to power the market size for the global solvents market over the forecast period. On the other hand, increasing environmental concerns is expected to slow down the development of the global solvents market. Nonetheless, commencement of green & bio-solvents and in-progress research and development are likely to offer new opportunities to the major mechanist of the global solvents market in the years to come. In addition to this, the investments in the Chinese transportation industry have elevated in the recent times. Transport Ministry of China and NDRC (National Development and Reform Commission) have projected to spend USD 724 Billion till 2018. This done to construct 303 major transportation projects, comprising highways, railways, airports, waterways, and urban rail, thereby boosting the global solvents market. With over 40.0% share, Asia Pacific ruled the global solvents market in 2016 and it is also expected to be the quickest developing market in the years to come. Up-and-coming markets in Asia-Pacific are expected to offer the great scope to the key players in the global solvents market in the years to come. Asia Pacific was chased by North America and Europe for the global solvents market in the same year. These both regions are mature areas for global solvents market. Hence, they are anticipated to see a stagnant development for the global solvents market in the years to come. Relatively, Middle East & Africa and Latin America are likely to witness noteworthy development in the years to come. The rest of the world is expected to show a steady development for the global solvents market in the forecast period.